Home Run and Grow Operations Hiring In-House vs. Outsourcing: Which is Suitable for Your Business Growth? In the US alone, consumers spent over $450 million online for retail purchases in 2017 and the number is on the rise. Even companies which are not monetizing from their websites directly are using them to lead customers into their stores. If you are a small business, then the question of whether to get things done in-house versus outsource has surely crossed your mind at some point or other. The question can an especially tough one if you’re considering something out of your core business area, for example, having a fully functional website. Not all businesses are in the field of Information Technology and even for those who are, web development is a very specific area of knowledge. A website is a very good tool which can be used to further business growth or even be monetized, and as such has become a bit of a conundrum for many businesses. At the very least, you will probably need email hosting, which can be your first step towards a better web presence. Yet overall, the main challenge is to be able to tap into the advantages a website offers most cost-effectively. 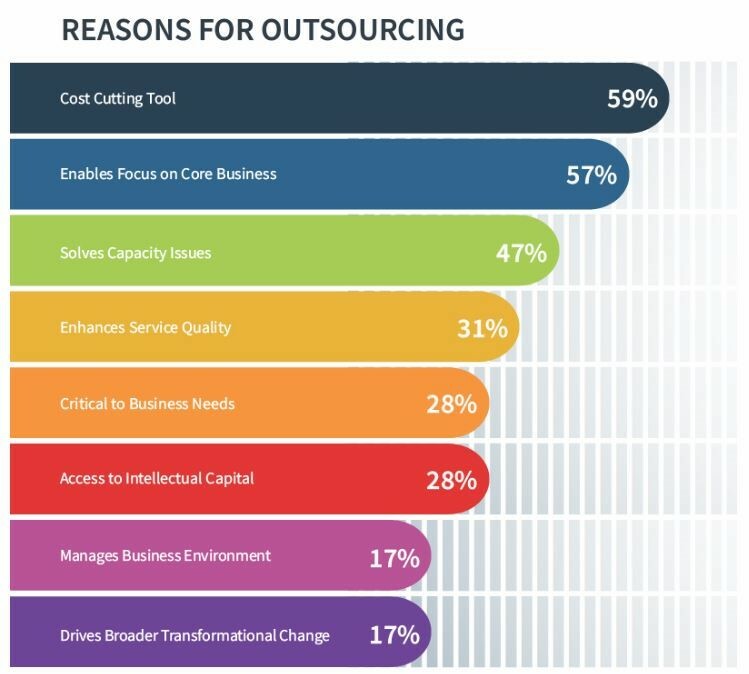 As such let’s look at some of the differences between hiring in-house versus outsourcing. To increase staff count is always a tricky question. Especially true for small businesses, any change in staff count will likely have a significant impact on your bottom line. There is not just the consideration of salary, but also other benefits such as healthcare, insurance, and even office space and equipment. There is also the question of the level of expertise—if you take on highly experienced staff to meet your requirements, their level of pay will likely commensurate with that experience. You are also taking on the risk of hiring the right staff to do the job since the employment process itself will take time and money. On the other hand, finding the right staff can bring you long term support with people who are of the same mind as you in your business. You can control the exact priorities they place on work-related tasks and be able to make any changes you may decide on more rapidly. Also, because web development may not be an ongoing thing for your organization, what happens when the project is over? Will you be left with an extra headcount that has no real relevance to your core business operations? The buy-in cost for outsourced projects is generally higher than what your typical staff salary may be. This is because you are paying a premium for very specific talent and a deliverable project. Of course, costs can vary greatly depending on where and whom you outsource the project to. Outsourcing also gives you the opportunity to work from a fresh perspective as it is likely you will be looking at outsourcing to an experienced company or person. You can benefit from this experience by asking them for suggestions or feedback on your proposed project and getting a fresh overall view of things. Outsourcing projects to other countries may cost you a lot less, but you have very little control over the development process which may lead to quality issues. This is compounded by the fact that all you might have to work within taking on an outsourced developer would be general reputation and a limited portfolio of past works. There may also be logistical challenges if you outsource to another part of the world that might have time zones vastly different than your own. This could lead to delivery timeline issues or in a worst-case scenario, even difficulties in communication. As you can expect, outsourcing will be approached on a per-project basis and this helps you control cost by maintaining operational costs while allocating a special budget for the project. Definitely! Another approach to the situation would be to work with outsourcing combined with an additional consultant who will have enough expertise to work with the outsourced project. This can help you evaluate potential outsourcing candidates and pre-empt problems with them further down the line. There are also technical interviews you may like your potential outsourcing partner to undergo to check that they really possess the skills they claim to have. There are sites which offer to help you facilitate these technical interviews since it is unlikely you will be able to conduct them yourself. Some examples of these are Codility and TopCoder. Another idea would be to find a partner to collaborate with. This is more difficult as it takes significant investment from both companies involved and a possible diversion from your core business. By working with a technical partner to create a basic platform, you can both then market that platform together and monetize it even as you use it for your own company. There is always a risk involved for small businesses when undertaking new projects but the potential to benefit greatly from them is also very real. Studies show that over 64% of small businesses already have websites, but how many of them are getting the full value of them? Whether you choose to outsource your web development or not, that is a key consideration you should consider before embarking on your project. The website today is more than just a digital presence, it is an opportunity to carry out marketing activities, collect data for analysis, lead generation and eventually monetize from it. Jason Chow is a digital marketer and WordPress fan. He likes to connect with startups and bloggers. He believes reading and practicing what we read are important.